THROTTLE With TRUE MEMORY WALKAROUND and PROGRAMMABLE PULSE POWER, this just may be the Ultimate Throttle !! It provides the best slow starting and low-speed control I’ve experienced in any DC throttle. You can apply a tiny bit of throttle, then sit back and attempt to see the loco move; I’ve timed one of my switchers at a blazing 1 inch every 12 minutes. The secret is in the pulse stream riding on the back of the DC level. The reason most locos won’t start and creep using your typical DC throttle is the inertia of the rotating portion (rotor) of the motor; the pulse stream from this little jewel provides a gentle “kick” to the motor, helping to overcome the inertia and allowing the loco to creep forward in a way that makes snails look speedy! Once the loco begins to move at greater than a scale 5-10 MPH, the pulse stream cuts off, leaving only the DC level. Plus…the Handheld Unit is a TRUE WALKAROUND. Unplug it, stroll around your layout, and plug it in anywhere. The train keeps moving at the same speed and in the same direction as you left it. Use either a toggle switch or two pushbuttons to control direction. Select 3 speed ranges with a switch, or have a single range. Choose the power supply voltage to match your scale. DO NOT BE ALARMED! 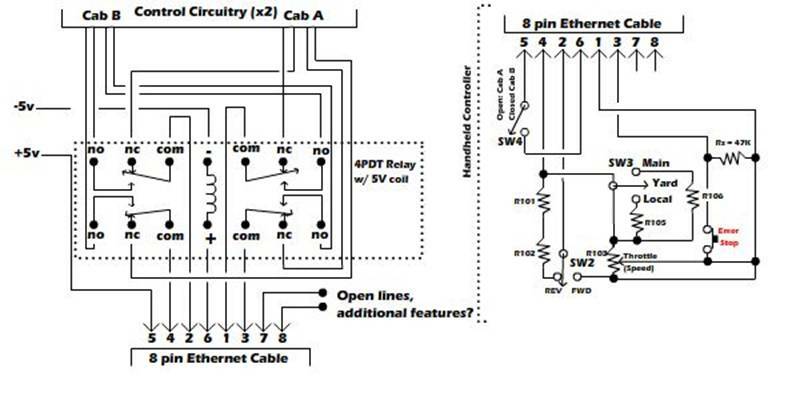 This circuit is simpler than it may first appear — there’s only one IC. I built my second one on a 2×3″ piece of perfboard. For the DPDT relay which provides reversing action I recommend Radio Shack 275-249 (or 275-249a); it has a 200 ohm coil, for which this circuit has been designed. If you wish to substitute a different relay, it should have a minimum contact rating of 5 amps, and you’ll need to adjust Rx to match the coil resistance (assuming you’re applying +12 volts to the circuit; if you’re applying +14 volts, adjust Rx to be 1.33 times the coil resistance). For the resistor Rx, it should be equal to the relay coil resistance (200 ohms — also see above) for a supply voltage of 12 volts (perfect for N-scale). If you’re running a 14 volt supply (as you might if you model in HO or larger and like to go real fast), increase Rx to 270 ohms. The capacitor Cx provides switchable MOMENTUM. If you’re not into such things, just omit Cx and the associated toggle switch. If you find that the 47uf cap shown doesn’t yield sufficient momentum for your tastes, increase it to 100uf (or more until you’re satisfied). If it provides too much momentum, you can try reducing the capacitor value, but you’ll likely soon run up against the limit as determined by the other 47uf cap (the one connected to the + input of the “Throttle Amp”) — it gives you the ability to unplug the handheld unit and walk around. You could reduce this cap to 22uf or so, but the price would be a shorter allowable time until you must reconnect the handheld (lest the train start to slow down). You may want to try a resistor (in the 1K-10K range) in series with Cx to increase the deceleration momentum. In summary, just fiddle with it until you’re happy. The Filter Cap shown on the schematic is usually a good idea unless you’re certain that there’s a large filter cap (the one following the bridge rectifier) located within 6 inches of the throttle circuit board. I put one there anyway. 1000uf at 25 volts (or higher) would do nicely; 2200uf would even be better if you’re more than 6″ from the rectifier filter cap. Two Handheld Unit implementations are shown above: personally, I like the pushbuttons — but some folks have told me that they prefer the visual indication of the toggle switch. You choose. I always make the connection from the Handheld to the Base Unit using a good ol’ telephone coil cord of a tasteful color and appropriate length. Don’t forget the double-check the continuity of the wires in the cord — telco cords transpose the wires left-to-right (better safe than sorry!). These Handhelds also include a “Speed Range Selector,” which works somewhat like the transmission in a car, allowing much finer control of loco speed. For example, in the YARD postion, the full rotation of the knob produces only a scale 10 MPH (or so); the LOCAL position takes you from zero to perhaps 35 MPH; the MAIN postion will allow you to go faster than you’ll want to. This feature is very similar to what you get from a garden-variety throttle using NAT (shown elsewhere on this site), and was suggested by fellow modeler John Lifer, Jr. If, however, you don’t want to include this “gearshift,” just omit the toggle switch and wire as shown at right. To fix the Pulse Amplitude, simply replace R11, R18 and R21 with a new 330K ohm, 1/4 watt unit as shown at left. To lock the Pulse Cutout voltage at approx. 1/3 of the supply voltage, replace R19 with the three 10K ohm, 1/4 watt units as shown at right. If you want to fix the Duty Cycle at the 8% value I’ve chosen for my N-scale switchers, then replace pot R20 with a 1M ohm, 1/4 watt fixed resistor and wire as shown at left. If you experiment with pulse streams and find that you need an even narrower pulse than 1ms (ie, duty cycle less than 8%), then try changing R3 from 100K to 10K. Finally, if you find that you need a faster Pulse Rate (ie, higher frequency), then decrease the value of C3 from the nominal 0.01uf to perhaps 0.005uf (which you could get by connecting two 0.01uf units in series. Want a slower pulse rate? Try 0.02uf by connecting two 0.01uf unit in parallel. Don’t try to wire directly to the IC — use the 14-pin socket as shown in the Parts List. Solder to the socket and insert the IC only when everything is wired. Similarly, when soldering to diode, LED or transistor leads, use a heatsink; heatsinks can be purchased from Radio Shack, Jameco, etc. I often use an old hemostat as a heat sink…or an alligator clip — anything to conduct heat from sensitive devices; clip the heat sink between the solder point and the body of the device. It’s easy once you’ve done it a time or two. Decoupling cap C2 should be as close as possible to the IC socket; I like to wire these between pins 4 and 11 of the LM324 on the backside of the perfboard. The PC board has the cap near enough, but if you’re comfortable doing so, attach it between pins 4 and 11 on the backside, ignoring the mounting holes on the PCB. The schematic shows a supply voltage in the 12-14 volt range. If you’re in N- or Z-scale, 12 volts is plenty; it’s probably enough for most HO types. Larger scales, however, may need 14 volts…or more; if you’re in G-scale and operate long trains (or like to go fast), you may want to go up to 16 volts. Keep in mind that the output voltage to the track will be 1.5-2 volts less that the supply voltage, and choose accordingly (the circuit will be fine up to 20 volts). All parts are readily available at RS, Jameco, etc. The LED (and Q1, R14 & R15) are optional, simply telling you when the pulses are on (it was useful to me, maybe not to you). If undecided, include it. LAST BUT NOT LEAST… Shown below is a PC Board layout for THE Throttle. There are three drawings, all 1:1 scale: the foil (copper, bottom) side, the component side (top), and a composite drawing to help you visualize what’s happening. There’s no PCB for the handheld, as I found it easier to just wire point-to-point. My friend and Chief Proofreader, Dave Eisenstein, seems to have found all the goofs in the layout…so I’m hopeful it’s clean at this time (thanks, Dave). If you have any questions about the PCB, just ask. to the fullest by “time-sharing” a handheld unit between two completely separate throttle base units.